West Windsor, N.J. –When Mother’s Day rolls around this weekend, clients at the Mercer County nonprofit HomeFront will have a family portrait in hand to commemorate the occasion. On March 23, Mercer County Community College’s (MCCC’s) Documentary Photography class went on location to HomeFront’s Family Preservation Center, a safe haven for 40 homeless mothers and their children, for what has become an annual Mother's Day Portrait Shoot. Last week the portraits were delivered to some very happy moms. “The photos are unbelievable and our mothers are thrilled to have these portraits. They’ll be treasured memories, I know. We can’t thank the MCCC photography students enough,” said Liza Peck, Volunteer Coordinator for HomeFront’s Family Preservation Center. 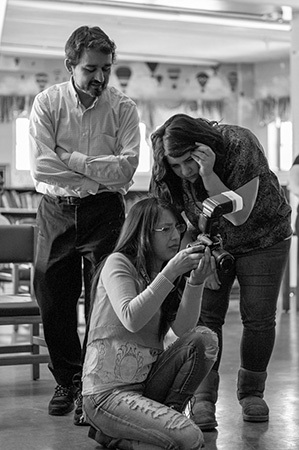 The outreach project was started seven years ago by Photography Program Coordinator Michael Dalton. 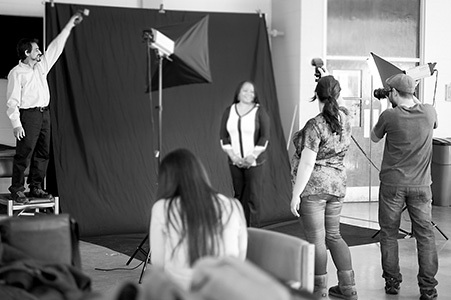 "It’s a nice experience for the clients of HomeFront to receive professional family portraits for Mother's Day -- and it’s a fantastic experience for my students,” Dalton said. “They really get into the spirit of the event and enjoy working with the mothers and their children. I think the students come away with the feeling that they have done a little something to help those who are less fortunate than themselves." MCCC photographers included Marlena Becker, Diana Chuqui, Jeff Gelt, Amy Karatka, Jonathan Laggiard, Casey Lebiedziewicz, John Pisano and Grace Spencer. Since its inception 20 years ago, HomeFront has worked to end homelessness in Central New Jersey, providing a holistic array of services for clients who are either homeless or at high risk of becoming so. Among the organization’s services are emergency shelter, assistance with housing searches, employment readiness training and job placements. From left, Marlena Becker, John Pisano and Amy Karatka. Photo by Jon Laggiard. 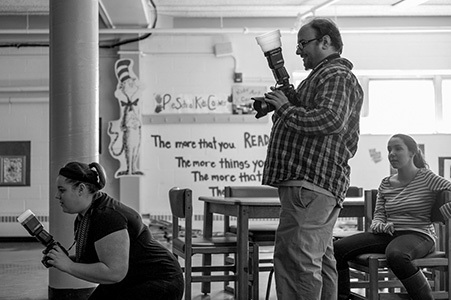 A HomeFront employee helps students test their camera settings before the shoot. Photo by Jon Laggiard. and students Diana Chuqui and Grace Spencer.